After a long hiatus, the pathway leading through the Korman Quad will be opened up to Drexel students for use before the beginning of the fall term. 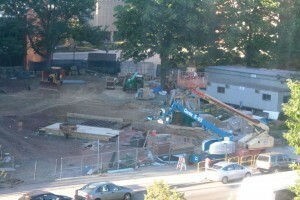 The path, which leads through the quad opening onto Chestnut Street, was originally closed off in 2008 due to the beginning of construction on the new Papadakis Integrated Sciences Building. According to Gennaro Leva, Drexel’s senior director of construction planning, the path will still be closed off for as long as possible because of some last-minute paving work that needs to be done before students arrive back on campus in the fall. “We’re looking to have it opened around the first week in September, but maybe even a little sooner,” Leva said. Brittany Cumens, a junior majoring in behavioral health counseling, counted herself as one of those excited to hear that the path would be opening soon. Despite being at Drexel for two years, Cumens has yet to use the path hidden behind the blue barricades that have lined the construction sites around Drexel’s campus. However, Nick Golia, a junior majoring in business, remembers that it was only a few weeks into his freshman year when the path was shut down. Construction that caused the path to be closed off is part of the Drexel Master Plan, an itinerary for the improvement of Drexel from the present until the University’s sesquicentennial in 2041. The Papadakis Integrated Sciences Building was one of 11 projects that were specifically enumerated in the 2007 Master Plan. Despite his indifference to the use of the path now, Golia still has a positive outlook concerning its opening. More information about the changes occurring in the Drexel Master Plan can be found at http://drexelmasterplan.wordpress.com.